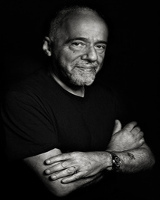 Paulo Coelho 24 August 1947 Brazilian Pedro Queima de Coelho de Souza Lygia Coelho Journalist, Author, Theatre Director, Musician, Novelist, Lyricist, Actor Brazilian lyricist, novelist and got numerous international awards. His novel The Alchemist has been translated into 80 languages. Coelho has sold over 200 million copies worldwide and is the allotime bestselling Portuguese language author. A list of popular Hindi Paulo Coelho quotes are given below.